If you’re a BlackBerry user, you might be glad to know that Google is pushing out a new search facility that will let you find email and contact numbers on your BlackBerry devices. The new search feature allows you to just type in or speak the name of your contact and Google Mobile app will search through your device to find the email or contact number. It’s a pretty useful application especially if you have amassed quite a number of emails and scrolling through each one of them is already a painful task. Even better is the fact that you can reply to the email or forward it as soon from the search results that will be displayed by the Google Mobile App. The new feature also allows you to quickly call a contact or send an email or SMS just by typing the first few letters of your contact’s first or last name. The app will also suggest contacts as you type as well as present your most frequently contacted person on top of the suggestion list. If you don’t want this feature, you can still download the app and just turn off Phone Search from the options screen. 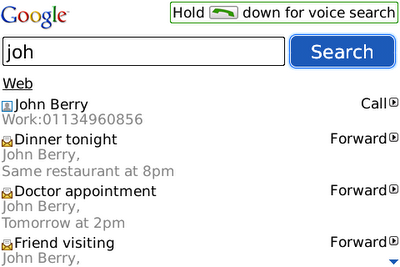 The new Google Mobile App search feature requires BlackBerry OS version 4.5 or higher. To download the app, simply point your BlackBerry’s mobile web browser to m.google.com.